You’ve heard about “Ride on Red,” but what does it mean? New traffic legislation has left motorcyclists across the state scratching their heads as they try to figure out what to do at an intersection. If you were hurt in a collision and you’re not sure how the PA motorcycle red light law might affect your case, turn to personal injury lawyer Brad S. Tabakin for guidance. Mr. Tabakin is a motorcycle enthusiast himself and has spent his career helping riders and their families recover the compensation they need to move on with life after serious accidents. Call 877-333-0330 to schedule a consultation, and don’t forget to join our Facebook Group to keep up with the Bikers Have Rights community. What Are PA’s Motorcycle Red Light Laws? In 2016, a bill called “Ride on Red” was signed into law. The law enabled drivers to make a decision to drive legally through a malfunctioning or unresponsive red light. 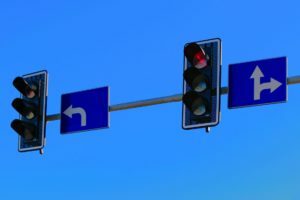 This bill was introduced to assist motorcyclists who often found themselves stranded at intersections after their smaller two-wheeled vehicles did not trigger the traffic light sensor to shift the light from red to green. Although this law makes it legal for motorcyclists to drive through a red light if it doesn’t change to green, it is critical that riders always proceed with caution. Drivers approaching from the intersecting road will not expect you to pull into the street. If you were hurt in a motorcycle crash at an intersection, you may be entitled to compensation for your medical expenses, lost income, and other damages. Motorcycle accident attorney Brad Tabakin can review your case and help you determine the most strategic way to proceed with your claim. If you have any questions about Pennsylvania’s motorcycle laws or have been involved in a motorcycle accident that wasn’t your fault, it’s time to turn to auto accident lawyer Brad Tabakin. Call 877-333-0330 today to discuss your case.